Moodboard: We hadn’t seen a Lacoste show since Felipe Oliveira Baptista announced his departure from the house last May, and the crocodile-logo brand was in design limbo until, in early October, it was announced that Louise Trotter would take over. Having previously worked for Joseph, the British designer seemed like a good fit for the brand. The question in the air, as guests entered the Tennis Club de Paris (how fitting) to witness her first show, was whether she would be able to translate the chic London look of Joseph into an inherently Parisian – yet globally appealing – sense of style. The answer was an overwhelming yes. Trotter returned to the roots of the brand founded by René Lacoste in 1933 with a collection that was inspired by both the classic tennis aesthetic and the needs of every modern, urban wardrobe on the planet. Best in show: With a colour palette taken from tennis courts, all grass green, clay, yellow and white tones, Trotter reminded us that we were in sport chic territory. The first look set the tone of the relaxed collection: an ultra-desirable double breasted camel coat was paired with a shirt, slouchy trousers, tennis shoes and a baseball cap. It looked as comfortable as it did stylish. 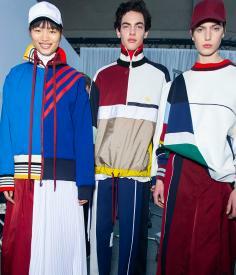 It was followed by more slouchy trousers, vareuse shirts and chunky terrycloth hoodies, elongated jersey polo shirts-turned-dresses and oversized coats and trenches with removable hoods. Winks were made to René Lacoste’s original style through XL cable knit jumpers (with embroidered effiloché crocodile logos) worn with pleated trousers and plissé skirt details. All in all, exactly the kind of clothes a young, urban population wants to wear. In the past, there has been a dissonance between what Lacoste has presented on its catwalks and what was available in stores… Hopefully this will no longer be the case, because Louise Trotter is literally bang on the money.